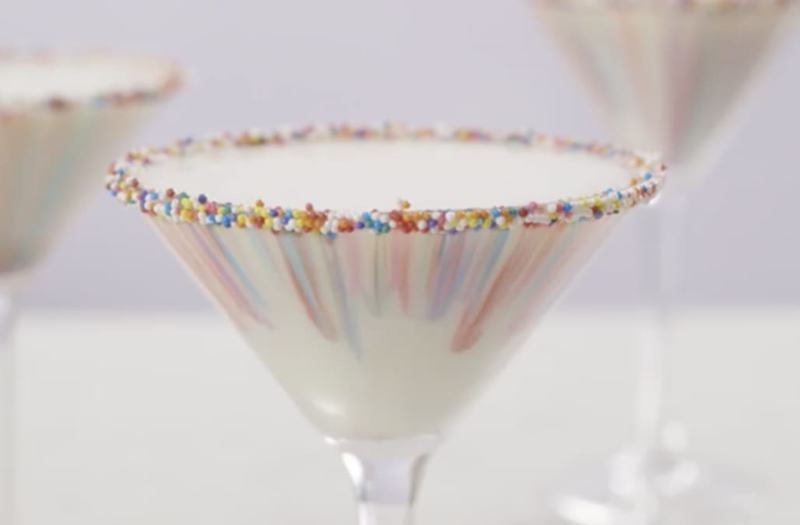 Sprinkled, not stirred -- that's how we're whipping up these delicious cake batter martinis in this week's episode of Cocktail of the Week! This yummy blend calls for sweet amaretto, a dash of white chocolate liqueur and a handful of colorful sprinkles for the most delectable drink we've ever tasted. Place sprinkles on a shallow plate that is a little larger than the mouth of your martini glass. Fill a dip plate with whipping cream and wet the rims of the martini glasses. Dip glass into sprinkles to coat the edges. Combine all ingredients in a cocktail shaker with ice and shake for about 30 seconds. Strain into martini glasses. Fill to the top (touching confetti rim) for rainbow streaked effect.